Another article, Ufuk Güven and the Mountain Marathon Team tells how on August 13, 2011, Ufuk, on a team with three of his friends, ran 32 km in the Aladağar Mountains, the tallest part of the Taurus Mountain Range. Ufuk is also the organiser of the Annual Meis to Kaş Swim and Canoe Race. Ufuk did not start his adventure activities until he was over 21 but he has more than made up for it since. He first took to them for the travel and, more importantly, for the challenge. He was young and thought he could conquer the world. His experiences have taught him great respect for nature and the wilderness. Ufuk says he sees the mountains, the rivers, the canyons and the forests differently than most people. Wherever he goes he looks at these places in nature as challenges, as places to study and try to understand. He sees nature not as something to conquer but rather to explore its hidden places. Ufuk Güven was born November 11, 1960 in Istanbul. He attended high school at the private French college Saint Benoit and later studied at Boğaziçi Üniversitesi where he graduated with an MBA. Ufuk is married to Gabi whom he met when she was a tourist and they have one daughter Aylin. For a while after they met, Gabi led some German tour groups. After Ufuk graduated from Bosphorus University he began his first outdoor and guiding activities. He first started mountaineering in 1981 with the Bosphorus University Mountaineering Club or BÜDAK (Boğaziçi Üniveristesi Dağcılık Klübü). Since there were so few of them, they had to share a club room with caving club members (spelunkers). In the early 80’s, there was very little professional equipment for mountain climbers. The club members found wool underwear and used Turkish military commando boots; everything else they had to make. Thermal underwear was unheard of at the time however, Ufuk was sensitive to wool next to his skin so he had to wear his father’s silk pajamas under his wool underwear. Club members made their own ice axes from a metal shop and covered the handles with polyester. They also found a shop that helped them make aluminum snow shoes, afterward the club members tied all the straps and strings themselves. In the 1980’s, there were only about 40 mountaineers in the country. Every place they went they were treated as aliens by local people. Their first climbs were usually endurance climbs carrying 25k packs in the winter up the rocky mountain faces. One of the mountains they tackled was Mount Erciyes at 3917 meters high “is one of the most fascinating volcanic mountains of the world. 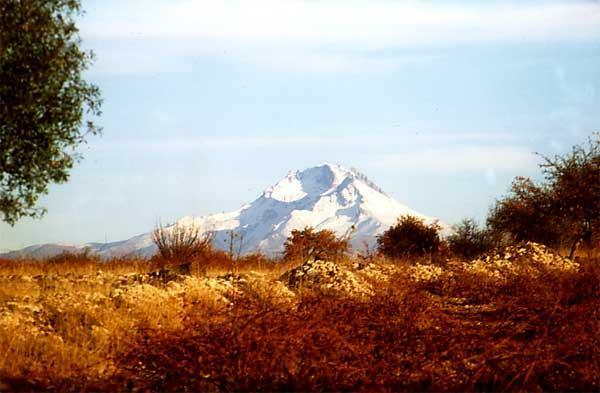 It is located in Central Anatolia and ranks as the fifth highest summit in Turkey.” Kayseri, north of the Cappadocia region, is the nearest city to Erciyes Mountain. On one of these climbs, the group took a rest stop and Ufuk fell asleep. When he woke up the group was gone! They had not taken a count and trekked on without him! They had about a two hour head start on him and fortunately he caught up with them at a later rest stop at a mountain lodge. They were surprised when he walked in as they had not missed him until that moment! Ufuk started his professional career as a summer job between semesters until he graduated from the university. He began by guiding French trekking groups in the summer of 1983 in Aladağlar in the middle Taurus mountain region. During these treks Ufuk ordinarily did not take locals on hikes with his customers, however one day a hotel receptionist asked to accompany him on a trek to Mount Nemrut. Ufuk reluctantly agreed and the next day they started out with Ufuk’s customers, a French couple. They later stopped at a cottage where a local man lived. The receptionist noticed a rifle hanging on the wall and asked the man living there if he could look at it. The man agreed and gave it to him. The receptionist immediately pointed the rifle at Ufuk and his guests and pulled the trigger! The rifle fired and shot a round between the heads of the French couple. The receptionist immediately became angry at the cabin man shouting at him and asking why did he give him a loaded rifle. All the time not taking the blame onto himself for not determining if it was loaded or not before he pointed it at the group and fired. After that incident, only customers were allowed on his treks. In 1986 he started guiding groups in Eastern Turkey and then in the Lycian region in 1987. These treks were the first in the region. Ufuk was sent to Diyarbakır to meet a group of tourists who were to be taken overland to Trabzon, a distance of over 1500 kilometers. He arrived in Diyarbakır and received a Telex from his company which had a list of participants and his only instructions were “See you in Trabzon in two weeks”! So they set off on a two week sightseeing, walking and camping adventure from Diyarbakır to Trabzon! Today guides can find topographical maps and of course they have mobile phones and GPS instruments to help them. At that time, finding good maps was impossible. Ufuk used a road map of Turkey as his guide and asked villagers along the way for directions. Ufuk had to buy food along the way and did most of the cooking. They had to use pack animals or large overland trucks to carry their water, trekking gear, tents and even a raft. The tourist groups came from many different countries so the common language was English. Every two weeks for over four months, Ufuk did back-to-back turnarounds of this trek. After a 1988 holiday trip to South America to see Carnival in Brazil and Argentina he returned to Kaş. He proceeded to rent the Toros hotel which was the third biggest hotel in Kaş at that time. They renovated it so that by using solar heated water radiators in the rooms, it became the first hotel with proper heating in Kaş. At the same time he started walking groups with a German travel agency in and around Kaş and in the winter he started the first out of season walking tours in the region. They were quite successful, and between 1988 through 1994 averaged two departures every two weeks. In 1990, Ufuk planned and researched the high Lycian Way which is over 1000 m altitude as a summer walking route. Kemer/Tahtalı to Tlos is the longest stretch of this planned route, a mix of mountain and coastal walks, spending two days in Gömbe and two in Kaş. He determined this was not for the average tourist. It is a very difficult route because of the lack of water, remoteness of the region and the need for pack animals for any long distance treks. It is a very hard trek which should only be tried by professional or seasoned hikers. In 1991 he was a founder and partner of a company called Alternatif Tourism in Istanbul. This was the first walking, rafting and mountain biking company in Turkey. He determined correctly that alternative or adventure tourism was becoming popular and his company brought this popularity to Turkey. They also conducted the first guided walking trips in Istanbul. During this time Ufuk and his partners explored and charted several Turkish rivers and opened up their rafting potential by understanding the flow of the river, where are its rapids located and how to bring tourists safely through white water areas. His team did the first complete research of the Dalaman river in 1994. In May and June of that year, they started regular rafting trips on various rivers which they felt were safe enought for regular tourists. They had to import the first river raft to Turkey. There was no information at that time about Turkish rivers so they had to teach themselves proper navigation and safe passage by trial and error. Alternatif Tourism was the first Turkish company to start rafting tourism on the Köprüçay river. Ufuk was the manager of the river base which is about 70 km east of Antalya close to Aspendos. When they first started they felt lucky if they had five groups of perhaps 80 rafters in a day. Now the Köprüçay is now the most popular rafting river in Turkey and there are, on average, over 3000 people daily with over 500 groups of tourists. Ufuk and his partners received training in outdoor management training from two former British commandos who came to Turkey for the two week training sessions. One of his partners also went to the United States and participated in similar training from an American company. They then started the first outdoor management training programs in Turkey. They organized several corporations to come to Lycia and other parts of the country for this training; for example Pepsi and Coke employees. These activities were group play exercises in and around the mountains near Antalya. Their objectives were group team building, problem solving under rugged conditions and how to conduct proper observation reports of these events. Ufuk sold his interest in Alternatif and moved back to Kaş in 1996. He purchased a partnership in Bougainville Travel (BT) from a local carpet dealer who was, for some unknown reason, an initial investor in the company. After his return, he researched completely the region called Lycia. He knew that it is the only place other than the Kemer region, where the mountains are close to the shore and which can be quickly reached for outdoor activities. It was obvious to him that Kaş was the ideal place for outdoor tourism and he was determined to create “The Adventure Capital of the Med.” BT changed the image of Kaş into an outdoor adventure activity town rather than a cheap place for English tourists to stay in a hotel and get sun and beach time. Ufuk and his new partners decided that Kekova with its sunken ruins was a great spot for sea kayaking so they purchased the first kayaks in the region and introduced the first seakayaking trips to Turkey. Besides this, they also started the first mountain biking and canyoning activities in the region. In May 2009, Ufuk opened the first high rope course of Turkey called Yüksek Parkur or Adventure Forest. As before, he sensed the time was right and the potential was good for a different kind of outdoor activity to be introduced into Turkey. So far, he has been correct.